InGastown Vancouver Gastown Condos for Sale! An incredible Vancouver real estate opportunity is now here! Centrally located in the historic Vancouver Gastown district, InGastown Vancouver condos are all about location and price. InGastown Vancouver presales is the latest condominium residential offering in Vancouver’s historic Gastown real estate neighbourhood that has seen a tremendous transformation and revitalization over the past decade starting with the redevelopment of the Koret Lofts and Woodwards District. Not only that, but the Gastown Vancouver InGastown condo project is also the only residential development in the heart of this historic district right now. Most other projects are further north in the up-and-coming Chinatown and Crosstown districts, which is not the same as Gastown living! This boutique collection of only 61 exclusive homes for sale will be located at 150 East Cordova Vancouver. Defining affordable homeownership in Vancouver real estate market, InGastown condos for sale will be located near SMART Gastown, a highly successful Concord development that was completed about 5 years ago. The presales Vancouver InGastown condos will start from an incredible mid $200’s with a very favourable deposit structure. Not only is this pricing suitable for first time homebuyers, but it also makes sense as a downtown Vancouver investment condo which will give you positive cash flow for life! The value is just undeniable and it’s coming very soon! Visit www.ingastown.com today for more details about this incredible downtown Vancouver condo offering! 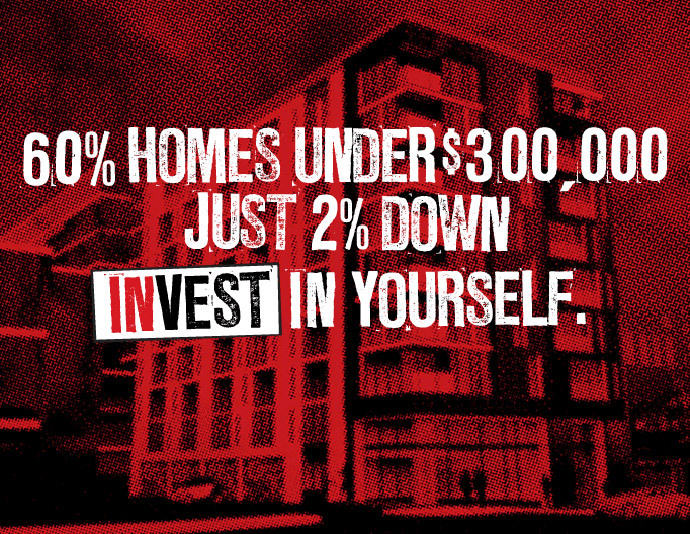 The InGastown condo sales team will be launching presales information in early Summer 2013. Stay tuned! Live in the heart of Gastown culture – 1Beds from mid $200s. 60% of homes below $300,000. Favourable deposit structure starting from just 2% Down! INVEST in yourself! Something for everyone, the InGastown apartments in Vancouver’s Gastown district is an affordable homeownership opportunity in downtown. Starting from the mid $200,000 range with a great deposit structure for homebuyers, the presales Vancouver InGastown apartments will provide easy access to transit routes, downtown Vancouver amenities, the waterfront district, West Coast Express/SeaBus/SkyTrain access at Waterfront Station and most importantly, the Gastown culture. Undergoing significant changes over the past few years, the Gastown real estate district is hip, urban and exciting as well as extremely safe. InGastown Vancouver presales apartments offer the best of urban living in this historic location, but it is also affordable. The homes have been meticulously crafted and designed to maximize your liveability and functionality at an optimal price. Affordable homeownership in Vancouver Gastown is now here at 150 East Cordova Street! 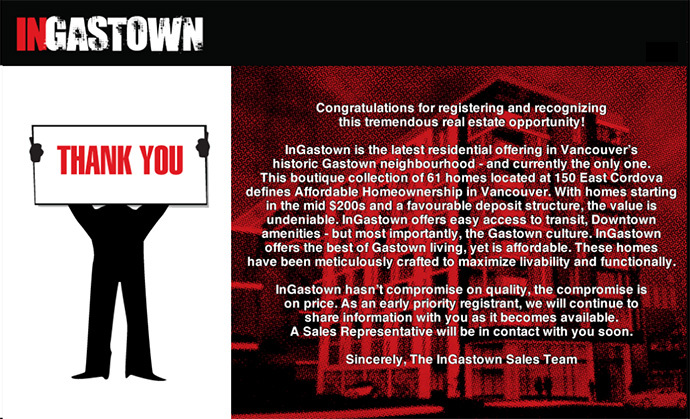 The presales Vancouver InGastown apartments has not compromised on quality at all. The only compromise is the price! As a property investor, you can easily positive cash flow on these Gastown apartments for a long term property investment opportunity. As a homebuyer, affordable homeownership in Vancouver downtown has never been as easy or affordable as now. InGastown is where affordability starts and where you can tell all your friends that you call home. No InGastown floor plans have yet been released. The pricing ranges will be released in early Summer 2013. Renderings and interior specifications will also be released during the presales Vancouver apartment launch event expected to come soon. The project is brought to the market by MyGastown Development Lp. Invest in Yourself. Invent your Future. Become Involved. Aren’t you Intrigued?